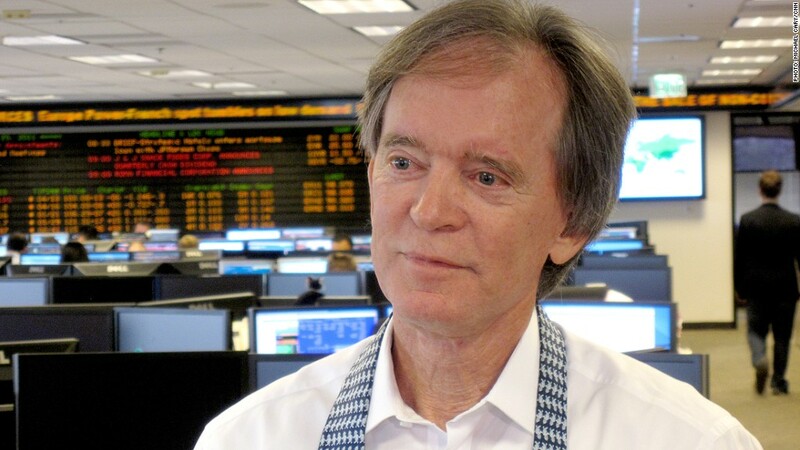 Pimco's co-chief investment officer Bill Gross tells investors to stay in Treasuries. The world's largest bond fund has been burned by the recent carnage in the bond market, but Pimco's founder and co-chief investment officer Bill Gross still thinks Treasuries are a good bet. In his monthly letter to investors, Gross said now is not the time to jump ship. "The U.S. economy is not sinking, nor are the majority of global economies," he wrote. "Their markets just had too much risk. In effect, the ship was top heavy with too little ballast. Guess I should have known, huh?" Pimco's Total Return Fund (PTTRX) is down 4% over the past month -- a major blemish for a fund that's up nearly 7% on an annualized basis over the past five years. The yield on 10-year Treasuries recently rose to 2.65% -- its highest level since August 2011 -- as investors started worrying about when the Federal Reserve would start pulling back on its bond buying spree. But Gross thinks yields have overshot and will dip back to 2.2%. Now is not the time to exit or even scale back on Treasuries, he said. But the ship is not sinking, said Gross. Investors had simply taken on too much risk, expecting the Fed to keep throwing out a lifeline. While Treasuries are typically considered a safe haven because of implicit government backing, investors went a little overboard. Now, they've run for cover too soon. While Bernanke has said that the Fed will eventually cut back on its bond buying, Gross says the tapering won't happen as soon as the market is currently predicting. The economy simply has too many headwinds. Housing, for one, could wind up putting a kink in the recovery. The rebound in that sector has recently helped rev up the economy, but that growth engine is already stalling. Mortgage rates, Gross noted, have jumped dramatically during the past six months. (Mortgage rates soar). At some point, it will start to be a tough pill to swallow for both prospective and current homeowners. The Fed is also unlikely to raise interest rates for at least another year or two. It would only do so if unemployment falls to 6.5% and inflation tops 2%. Currently inflation is sitting comfortably around 1% and the unemployment rate is 7.6%. Still, Gross says investors should ride out the rocky seas. "Will there be smooth sailing tomorrow? 'Red sky at night, sailors delight?' Hardly," he wrote. It's unlikely that bonds will perform as well as they have over the past 20 to 30 years. Returns will more likely hover between 3% to 5% per year. But Gross says, "Don't panic." This bond boat won't capsize.